SSC Public Examinations March 2018 to be held from 15.03.2018. Hall Tickets already dispatched to the Head of the Institutions. 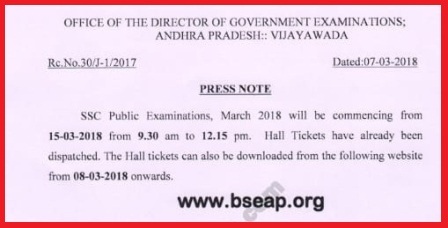 The Hall Tckets can also be downloaded from the following website from 08.03.2018 onwards www.bseap.org Students who have not recived or lost the hall tickets shall download the same from the website and get them attested by the Headmaster concern.